that’s the preferences and opinions of the people who care about this unique species. We’ve spent the last decade learning about the biology of alligator gar, and from that we know that we have a variety of management options on the table. What we need now is constituent input. Warren Schlechte is a research biologist at Heart of the Hills. He and other inland fisheries staff are using a voluntary online survey to better understand who their constituents are, how anglers like to fish, their harvest practices and how they’d like to see alligator gar managed in the future. We know a lot of people value this fish. To make sure we’re getting the best decisions moving forward we want input from all. After the information is collected, inland fisheries staff will use it to inform future management decisions about alligator gar fishing rules and regulations. At the end of the day our mission is to provide an enjoyable fishing experience for today’s anglers while conserving the species for tomorrow. By balancing sound science with our constituents desires we believe we can achieve that goal. The survey’s available June 15 through the end of July. Find a link to it at passporttotexas.org. 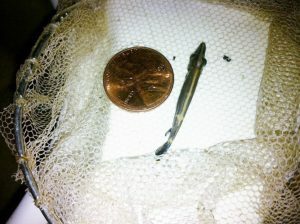 A weeks old alligator gar. As popularity of alligator gar increases in Texas, fisheries managers want to ensure the harvest of these fish is sustainable. 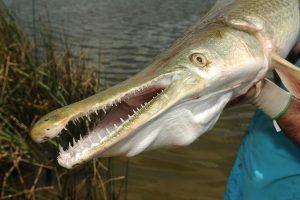 Due to increased interest and popularity – and the fact that alligator gar have been extirpated from much of its native range – Texas Parks and Wildlife took steps in 2009 to protect and preserve the future of this species in Texas waters. Greg Binion, a fisheries biologist, says a conservative one-fish daily bag limit implemented by Texas Parks and Wildlife in 2009, helped to restore quality trophy populations to several Texas fisheries, including Choke Canyon Reservoir near San Antonio. Our management goal for this fishery is to enhance and protect the trophy component of this fishery, and we are using the 1-fish daily bag as one of the tools in our tool box to accomplish this goal. This appears to be working well, as we have several reports and confirmed catches from anglers regularly catching trophy-sized fish in excess of 6 and 7 foot in length. In the 1980’s, this reservoir was commercially fished down to the point where the gar couldn’t reach trophy size in large numbers. Now in a rebuilding phase, things are looking up for both alligator gar and anglers alike. The Sport Fish Restoration Program supports our series; your purchase of fishing equipment and motor boat fuels keep the wild in Texas alive. #GARWEEK. What a lovely smile. Because alligator gar are often confused with other gar species in the state, it’s often thought they’re widespread throughout Texas. But that’s not the case. So where can you find alligator gar in Texas? Alligator gar are up in the red river drainage in Lake Texoma, they are in all of the major river drainages in the east side of the state, and they are in every bay system and every river feeding those bay systems on the coastal part or portion of the state. They are also in the Rio Grande. Noticeably absent from that list is Central Texas. Michael Baird is a fisheries biologist in the Waco district who is studying alligator gar populations in the lower Brazos River. We have had a lot of reports of alligator gar in the middle part of the state but we’ve never confirmed reports of alligator gar in major reservoirs between Waco, Austin and San Angelo. If someone sees one we would like to see it. 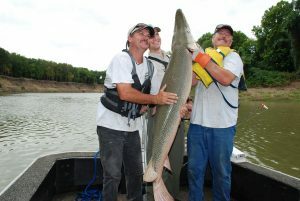 After more than ten years studying this species, Inland fisheries researchers at parks and wildlife have learned a lot about alligator gar in Texas. But they don’t know much about the anglers who fish for them. This month they will be launching a survey to learn more about how anglers and non-anglers feel about these charismatic and misunderstood freshwater fish. Pre-register to take the survey and learn more about alligator gar ID and distribution on the new TPWD alligator gar website. Find a link to it at passporttotexas.org. Alligator gar are Texas’ largest and most long-lived freshwater fish. People claim to see alligator gar just about everywhere in Texas, but they are one of the most misidentified species of fish around. The main thing Texans need to know is that there are four species of gar in the state of Texas. And it seems like everybody thinks every gar they see is an alligator gar – and that’s not the case. 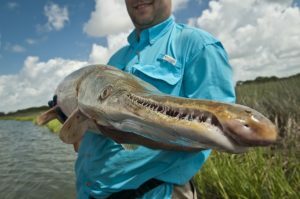 Michael Baird, a fisheries biologist for parks and wildlife, says even among the four species of gar that occur in Texas —spotted, longnose, shortnose and alligator gar — this species is unique. The easiest way to tell the difference between alligator gar and spotted gar is in the name. The spotted gar are the only gar species that have spots all over their head and body. Longnose gar are the most abundant gar species in the state, but the name of this species also clues anglers to the best way to tell them apart from an alligator gar. The way you can tell the difference between an alligator gar and a longnose gar is from the top of the fish looking down on the head – if it’s alligator like it’s probably an alligator gar. If it has a really narrow snout it’s probably a longnose gar. The fourth species – shortnose gar – can only be found in Texas on the Red River below Lake Texoma along the Oklahoma and Arkansas borders. If you’re up there you might see a shortnose gar, if you’re not there you are not going to see one. Tomorrow: where to find alligator gar in Texas. You are currently browsing the archives for the #GARWEEK category.